Toronto Film Society presented Doctor in the House (1954) on Sunday, March 17, 2019 in a double bill with Happy Ever After [Tonight’s the Night] as part of the Season 71 Sunday Afternoon Film Buffs Series, Programme 6. Released by: General Film Distributors. Director: Ralph Thomas. Producers: Betty E. Box, Earl St. John. 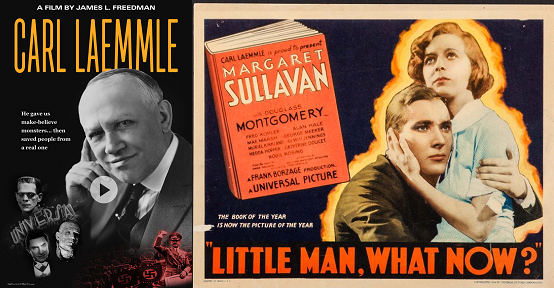 Screenplay: Nicolas Phipps, based on the novel and adapted for the film by Richard Gordon. Music: Bruce Montgomery. Cinematography: Ernest Stewart. Film Editing: Gerald Thomas. Art Direction: Carmen Dillon. Release Date: February 2, 1955. Cast: Dirk Bogarde (Simon Sparrow), Muriel Pavlow (Joy Gibson), Kenneth More (Richard Grimsdyke), Donald Sinden (Tony Benskin), Kay Kendall (Isobel Minster), James Robertson Justice (Sir Lancelot Spratt), Donald Houston (Taffy Evans), Suzanne Cloutier (Stella), George Coulouris (Briggs), Jean Taylor Smith (Sister Virtue), Nicholas Phipps (Magistrate), Geoffrey Keen (Dean of St. Swithin’s Hospital), Martin Boddey (Demonstrator at Pedal Machine), Joan Sims (Rigor Mortis), Ann Gudrun (May), Harry Locke (Jessup), Cyril Chamberlain (Policeman), Ernest Clark (Dr. Parrish), Maureen Pryor (Mrs. Cooper), George Benson (Lecturer on Drains), Shirley Eaton (Millicent “Milly” Groaker), Eliot Makeham (Elderly Examiner), Joan Hickson (Mrs. Groaker), Brian Oulton (Medical Equipment Salesman). “While we were struggling to find an ending for a poor script in Cyrprus (for They Who Dare), (film producer) Miss Betty Box, on a long and tiring journey from Scotland, left her train for a few minutes at Crewe to purchase some reading matter, magazines and a slim book, to while away the remainder of the trip to Euston. She was quite unaware that this simple action was to switch the points, so to speak, not only on her own life, but on mine as well. By the time she had reached London she had made up her mind to buy the rights of the book, and being the most far-sighted producer in the Rank Organisation at the time, did so, had a script roughed out, and sent it to me to see if I would like to play the young student. It was called “A Doctor in the House”. I was not, I remember, immediately impressed. It all seemed a bit light, the role a bit dim-witted, and every other character had funnier things to say and do. I was to be the simple Juvenile. (Anthony) Forwood, by now disenchanted with acting himself, although very successful, had generously renounced his own career and agreed to become my Personal Manager since I could now no longer handle my own affairs alone. 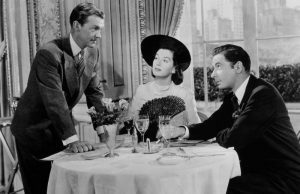 He was in complete disagreement with me; here was a comedy, for the first time, which could well be an important success and lead me away from spivs and service heroes to which I was obviously becoming addicted. He urged me to accept the offer immediately before it went to someone else. Impressed by his seriousness I telephoned Miss Box and said yes. But Miss Box, in her low and pleasant voice, confessed that there was, unfortunately, a hidden snag. 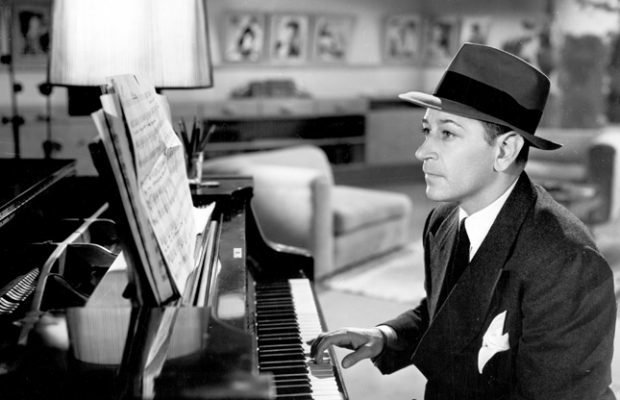 Mr. St. John, (the American film producer in overall charge of production for Rank), she explained gently, was strongly opposed to her choice of myself for the part. He didn’t think that I could play light comedy; my métier, he said, was action stuff. 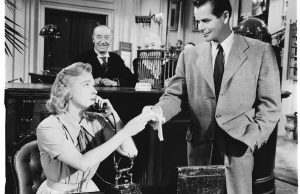 I did not have the necessary charm or lightness, and he reminded her that my last effort at comedy, at his own instigation, (this, I believe, was the 1952 film The Penny Princess) had been a complete and total catastrophe for all concerned; especially myself. It would be disastrous to play me in such a part. 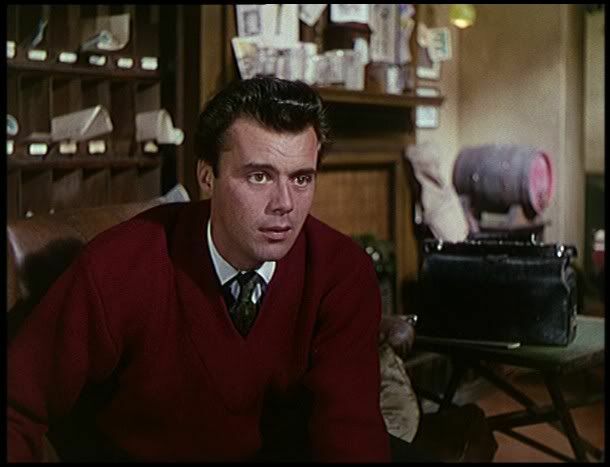 The storyline of Doctor in the House follows the fortunes of Simon Sparrow (Dirk Bogarde) starting as a new medical student at the fictional St. Swithin’s Hospital in London, England. His five years of student life involve drinking, dating women, and falling foul of the rigid hospital authorities, which all provide many humourous incidents. Sparrow is forced to leave his first choice of lodgings to get away from his landlady’s amorous daughter (Shirley Eaton), and he ends up with three amiable but less-than-shining fellow students as flat mates. 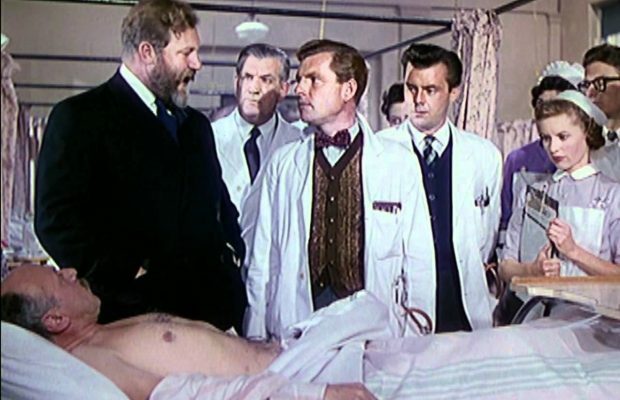 Simon’s friends cajole him into a series of disastrous dates: first with a placidly uninterested “Rigor Mortis” (Joan Sims); then with Isobel (Kay Kendall), a woman with very expensive tastes; and finally with Joy (Muriel Pavlow), a nurse at St. Swithin’s. After a rocky start, he finds he likes Joy a great deal. Meanwhile, Richard is given an ultimatum by his fiancée, Stella (Suzanne Cloutier)—graduate or she will leave him. With this ultimatum, he buckles down in order to graduate. At the climax of the film, there is a rugby match with a rival medical school during Simon’s fifth and final year. After St. Swithin’s wins, the other team tries to steal the school mascot (a stuffed gorilla), resulting in a riot and a car chase through the streets of London. Simon is almost expelled for his part in this by the humourless Dean of St. Swithin’s (Geoffrey Keen). When Simon helps Joy sneak into the nurses’ residence after curfew, he accidentally falls through a skylight. This second incident gets him expelled, even though he is a short time away from completing his finals. Sir Lancelot, however, has fond memories of his own student days; particularly of the Dean’s own youthful indiscretion (persuading a nurse to reenact Lady Godiva’s ride). His discreet blackmail gets Simon reinstated. In the end, Richard fails (as does Tony), but Stella decides to enroll at St. Swithin’s herself, so there will be at least one doctor in the family. Simon and Taffy graduate. As an interesting side note, this film was the first of seven Doctor films released between 1954 and 1970. 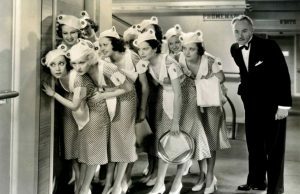 The critics found it difficult to determine precisely the reasons for the huge popularity of these films with British audiences, but producer Betty Box obviously knew what she was doing. She later recalled: “I think it was the youthful gaiety of it that made it so popular, and it was something everybody knows about—doctors, hospitals, and illness.” Also, she indicated that she was “very lucky” to get Nicholas Phipps to write the script. “There wasn’t a great deal of the book in it, except for the characters,” she said. 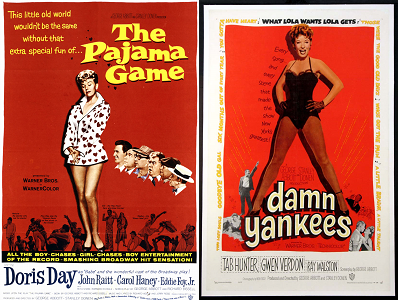 “I’d never made comedies before, but I reckoned I wanted to make it both real and funny, and so I wouldn’t deal with comedians.” After 1970, there were several theatrical follow-ups, as well as a 1970s TV series; all were based on the semi-satirical novels by Dr. Richard Gordon.